Truly Original: The revolutionary new mechanism is unlike any other charging handle on the market. We are pleased to receive U.S. Utility Patent No. 9964371, 9810494, 9587896. No Weak Roll Pins: Even the best-designed products fail at their weakest point and we have taken the infamous roll pins out of the equation. The RACK™ was designed with no roll pins. Smooth Sliding Latch: Not another pivoting mechanism to wear out the upper receiver notch, this patented latch system slides parallel with the receiver notch for slick and quick release and simultaneously minimizes wear. Asymmetric Charging: Purpose built with asymmetric use in mind, the RACK™ will handle left or right side pulls with ease. Regardless of your charging handle racking technique, the RACK™ will perform with consistent and positive assurance. Monolithic Modular Handle: Machined from one single piece of aluminum, the RACK™ handle was designed with strength in mind. It is also key to the sliding latch and the positive and balanced pull of the charging handle. MADE IN THE USA: The RACK™ is designed and engineered in the United States. It is precision CNC machined from billet 7075 T6 Aircraft Grade Aluminum in our brand-new manufacturing facility in Henderson, Nevada. Coated in a hard anodize black finish. For immediate release – VG6 Precision is proud to announce the launch of the new EPSILON 762 muzzle device. 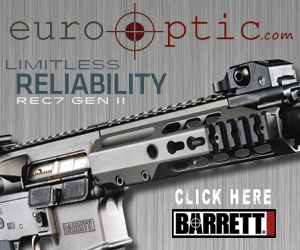 Compatible with most common .30 caliber chambered rifles, this hybrid device features both recoil compensation and flash signature mitigation in one package. With a continued focus on improved recoil control, the EPSILON 762 features a new enhanced chamber design that improves gas flow and felt recoil measurably over previous versions. VG6 also focused on saving weight during the design process by including aggressively cut channels along the length of the device. The EPSILON 762 retails for $94.99 and is available in Black Nitride and Bead Blasted Stainless Steel finishes.